Visual Guide to Lock Picking is een zeer uitgebreid boek waarin alle onderdelen van lock picking staan beschreven. Visual Guide to Lock Picking boek telt maar liefst 203 paginas met in het Engels geschreven Lock pick informatie. Hiermee is het een zeer uitgebreid boek voor Lock Pick geïnteresseerden en beoefenaars. This is the definitive guide for learning the art of lock picking. Inside you will discover the secrets of the trade. 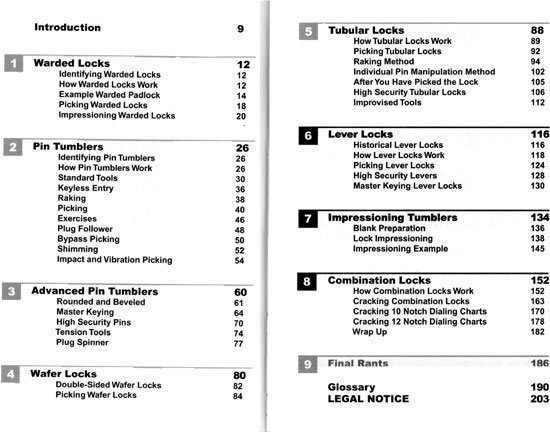 By reading this book, practicing, and applying the methods introduced, you can successfully become a master at picking all the common locks of today. This book makes it easy and gives you the edge to quickly learn what it takes others years to gather. This book is a valuable addition to any collection and will open doors for you. 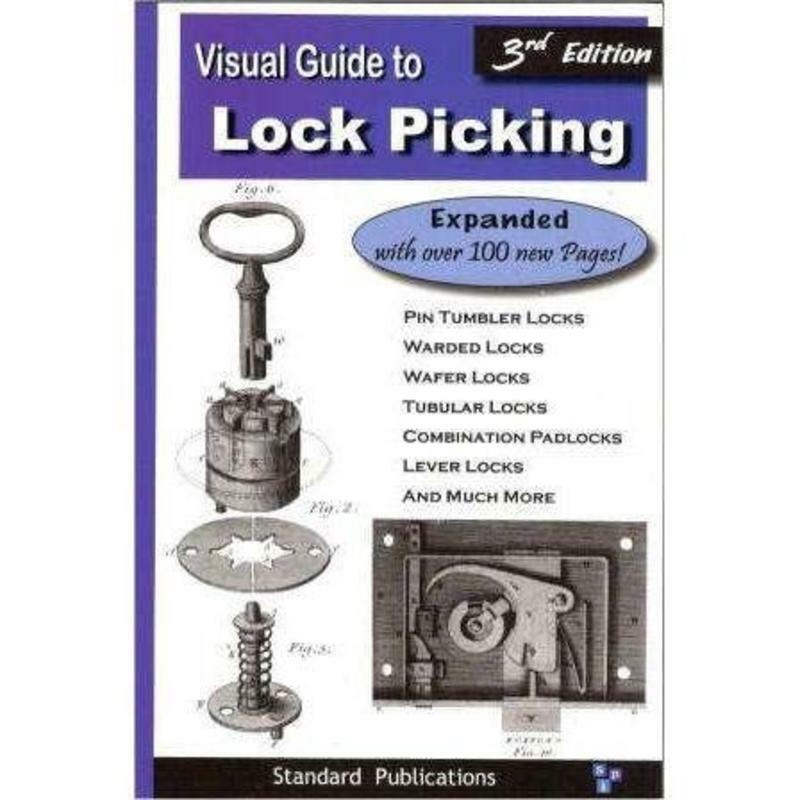 Not only does this book cover what tools and techniques are needed to pick most common locks, but it also goes through what to do step-by-step; and actually teaches you how to do it. It explains what all of the tools are and for what they are used. What really sets this book far above the competition, however, is the vast assortment of illustrations that make everything easy to understand. This really is a visual guide containing over 60 pages filled with diagrams and drawings that will instantly show you how locks work, and exactly what to do to bypass them. You can start learning today! This book makes learning the art of lock picking fun and easy. You don''t have to waste your time guessing how it's done, reading some amateur's theories, or trying to learn from the movies. (They always get it wrong). Now, you can get accurate information that the professionals use. Their secrets have finally been revealed. Inside, you will find sections about warded locks, pin tumblers, wafer tumblers, and more. These are the locks found on most residential and commercial doors, cars, padlocks, desks, filing cabinets, safes, equipment, vending machines, bike locks, etc... Each section includes a detailed and easy to understand explanation as to how that type of lock works. This book even outlines several exercises you can perform in order to improve your lock picking skills. You will be picking every lock in your house in no time. Now, you can understand the technology that has kept thieves at bay for centuries. Even in the time of antiquity, within the halls of the great pyramids, tomb raiders found their untold riches behind surprisingly sophisticated locks. Today's locks inherit these same principle designs. We give you the keys to their secrets. How many times have you or someone you know been locked out? Now, you don't have to be helpless in that situation while you wait and rely on some locksmith who is going to charge you a lot of money to do what you can do yourself. You don't have to be a victim of your circumstances. The next time someone forgets their keys, you can be confident with the knowledge that you can help yourself and your friends and save a lot of money in the process. This is the authoritative guide on lock picking. Even if you already know how to pick some locks, this book covers tips & techniques that you can use. This book is perfect for existing locksmiths, auto repossessors, and car dealers. Whether you are interested in becoming a locksmith, need to know how to bypass security locks for your job in law enforcement or emergency services, interested in lock picking as a hobby, just want to be prepared in an emergency, or for whatever reason, this book will get you started off right!